The word rapture comes from the Greek word ‘arpagesometha‘, which translates to ‘caught up’, or ‘taken with’. Most bible readers acknowledge this upcoming event, but there is division regarding the sequence of this event in relation to the antichrist rein of tribulation and the return of the true Christ. Therefore, three schools of thought are associated with the rapture event: Pre-tribulation — Mid-tribulation — Post-tribulation. The so-called ‘pre-tribulation rapture’, or ‘secret rapture’ gives the notion of the saints being spared from the terror of the antichrist reign. This view has become a very popular doctrine, but simply does not square-off with scripture. Consider just some of the many passages referring to the antichrist power which makes the persecution of the saints the very focal point of its reign. – So we have clear revelation in scripture which repeatedly describes the saints being the very prime target of the antichrist tribulation. “For as the lightening comes from the east and flashes to the west, so also will the coming of the Son of Man be. For wherever the carcass is, there the vultures will be gathered together. Immediately after the tribulation of those days the sun will be darkened and the moon will not give its light; the stars will fall from heaven, and the powers of the heavens will be shaken. I, myself was from the school of thought which taught the pre-tribulation rapture. I wanted to believe this, but I was also taught to be like a Berean— to search the scriptures daily to find out if such things are so. As I continually searched the scriptures, I was less and less convinced of such a notion as pre-trib rapture. Instead I saw the repetitious principle of an antichrist era which makes the saints of God its primary target of tribulation until the return of Christ. These two views are easily confused for “lack of definition”: If what is meant by the tribulation is – persecution of the saints from the antichrist rein, then we would be hard pressed to find scriptural support for mid-trib rapture. 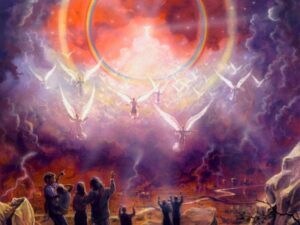 But many who maintain the view of a mid-trib rapture consider the second half of the tribulation as Gods judgement on the world, which His saints would be spared from. Hence, many mid-trib proponents discern the ‘wrath of Satan’ from the ‘wrath of God’. God’s saints being subject to Satan’s wrath via antichrist, but delivered from God’s wrath upon the return of Christ to judge the world. On this main point, there is agreement between the mid-trib view and the post-trib view – the only difference is what we consider ‘the tribulation’. So if what is referred to as the ‘great tribulation’ was meant to include Gods’ wrath, then I would have to agree to a mid-trib rapture, since God’s people are forgiven and spared from the wrath of God. However, I do not confuse the antichrist tribulation with the wrath of God because the scriptures do not. Matthew 24:29-31 makes it clear that Christ returns to take up His people and judge the world AFTER THE TRIBULATION. So we see the sequence of events, yet the scriptures differentiate these events by calling the former ‘the tribulation’ and the latter ‘the return of Christ’. ‘After the tribulation’ is just another way of articulating ‘post-tribulation’ which the scriptures declare. Even still, I do not have a big problem with those who consider the wrath of God as the second part of the tribulation, since that event will indeed be tribulation for the world; yet the scriptures are almost always referring to the saints (not the world) when speaking of the tribulation pertaining to the Church age, and I would prefer to keep the same continuity of the scriptures. Daniel’s Dream ~ What Does It Mean?